Blickenstaff bares the looks and voice of a leading lady, but one of her intrinsic qualities is often absent from those roles. “I’m funny! Not everybody’s funny, and I’m often lucky enough to go in for roles that know how to crack a joke. What can I say? I’m a chameleon!” Blickenstaff says with a hearty laugh. VIDEO: Heidi Blickenstaff on Susan Blackwell’s naughtiest qualities and the most recent text message she’s received from a [title of show] cast member. The California native got her start with ensemble and understudy roles in The Full Monty and The Little Mermaid, but Blickenstaff became a Broadway star by slaying audiences and touching hearts in the comedic cast of [title of show] in 2008. 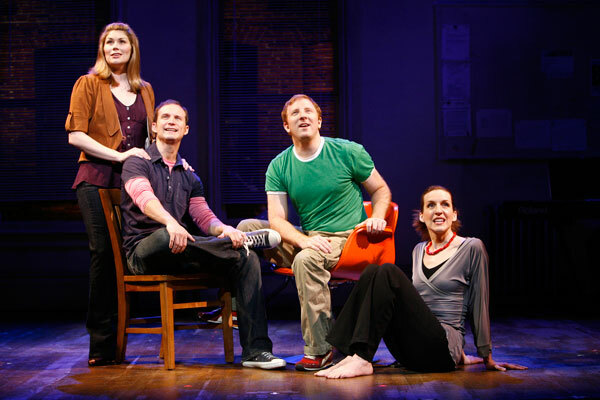 The beloved meta-musical about four friends writing a musical about each other not only launched stars Jeff Bowen, Hunter Bell, Susan Blackwell, and Blickenstaff with a passionate fan base, but also established the group as Broadway’s hippest new wiz kids. Productions of [title of show] are being produced at regional theaters ad colleges around the country, and have even gone international. “Never in my wildest dreams did I ever think we’d be going to Australia to see a production of our show and I’d be meeting the actress playing Heidi,” Blickenstaff said. Although she called the idea of being played by other actresses “super trippy,” Blickenstaff acknowledged it as a notion from which she has to separate herself. “That girl is playing Heidi; she’s not playing Heidi Blickenstaff. When we were doing the show, it became much less like going on stage and being ourselves every night and more like playing a character.” Now Blickenstaff says that when she sees a Heidi, she is filled with pride. In addition to their work being produced around the country, the [title of show] crew is ready to unveil their next collaboration. Previously billed as And Now This Is Happening, Blickenstaff said the title recently changed to NOW. HERE. THIS. Described as a “theatriconcert,” the show is a set of short stories interspersed with music, provided by a band—Larry Pressgrove, the lone keyboardist in [title of show] has got some company. NOW. HERE. THIS. uses Bowen, Bell, Blackwell, and Blickenstaff as the characters, but Blickenstaff said it is not a continuation of where [title of show] left off. Details of the story have yet to be released, but Blickenstaff said the piece was birthed out of a sketch the group presented two years ago at the Gypsy of the Year charity event, in which Bell and Blackwell discussed the first time they ever saw a Broadway show. NOW. HERE. THIS. will be presented in a workshop production at the Vineyard Theatre in late June. “It’s really new, but the same family is together and that chemistry will never go away,” Blickenstaff said. She described the members of the [title of show] group as “genuinely best friends,” citing that they are constantly on the phone with each other and vacation together. Despite working unpaid for years on the show that would launch their careers, the team has now branched out to individual projects and collaboration now entails new obstacles. Blickenstaff is true to her word. It is written into her Addams Family contract that she has approval to leave the show for two weeks in June to reunite with her [title of show] cast for their new show. Are you surprised by Blickenstaff’s maternal roles, Rushers? Have you seen her in The Addams Family? What do you think about the [title of show] team’s next collaboration on NOW. HERE. THIS.? Leave your comments below, and see Heidi’s appearance in this week’s episode of Stage Rush TV! Follow Stage Rush on Facebook and Twitter, and sign up for the weekly newsletter.